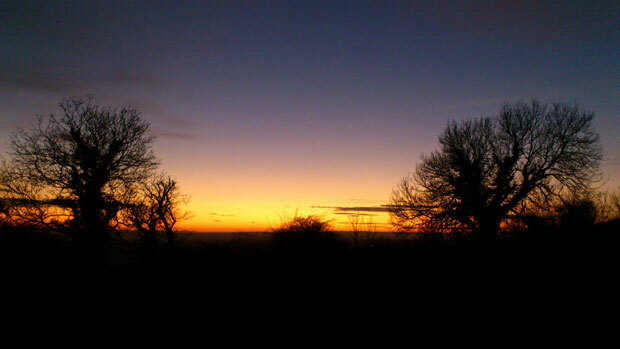 When I was younger, I used to sit on my garage roof and take photos of sunsets. I've been taking these kinds of photos ever since, from coasts to cities! Sunsets are absolutely incredible. They are a magical God inspired paint brushed mix of colours, strokes and light masterfully put together on the sky canvas by the Master Painter, God. In a way, they speak for themselves. 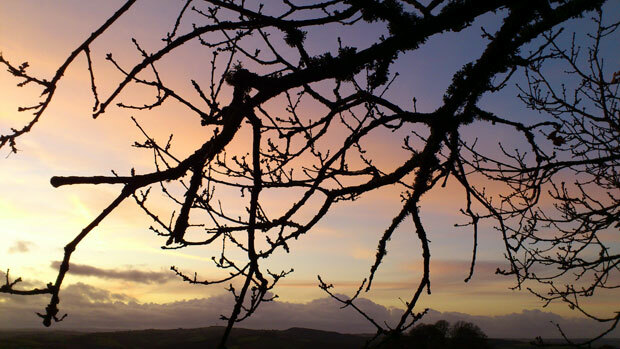 They point to the Creator God, the one who can fuse colours together in the sky in a way that no artist has ever done, like this photo taken in Devon. The picture below was taken from Sheepstor on Dartmoor, England. This is near the place where some of the movie 'War Horse' was filmed. Isaiah 42.5-8 (Message) - God's Message, the God who created the cosmos, stretched out the skies, laid out the earth and all that grows from it, Who breathes life into earth's people, makes them alive with his own life: "I am God. I have called you to live right and well. I have taken responsibility for you, kept you safe. I have set you among my people to bind them to me, and provided you as a lighthouse to the nations, To make a start at bringing people into the open, into light: opening blind eyes, releasing prisoners from dungeons, emptying the dark prisons. I am God. That's my name. I don't franchise my glory, don't endorse the no-god idols. A Prayer: Lord, you are the one who created the universe, who stretched out the skies, laid out the earth and everything and everyone in it. You are God and you have called me to live right and well. You have made me a lighthouse to my friends, families and the nations. You have called me to bring light into the dark. Like the sun at sunset, I will stand out as a light and create beautiful God-colours as you use me to open blind eyes, release the prisoners in spiritual, emotional and mental prisons. You are God and there is no other. Amen. Each year in Cornwall, England there is an event called 'Run To The Sun' which is a popular festival. 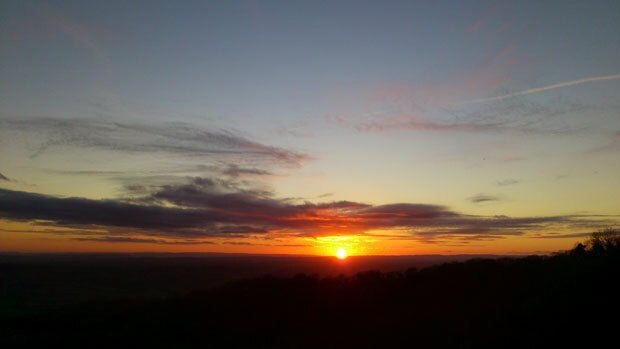 In a sense, a sunset gives us another inspiration, a Run to The Son. The Son of God whose name is Jesus; brings us freedom, never ever leaves us... 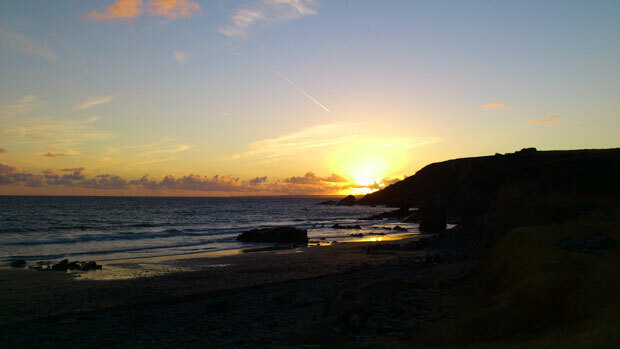 In our photo below, taken in Cornwall, we see the trail of a plane which almost looks like it's headed toward the sun. Our attitude should be the same. In my own Christian life, I've had many many times when I've had to run to Jesus for help, wisdom, encouragement, guidance and in times of pain and loss. But God has always been there and shown me his way, even when it's all a bit confusing or uncertain. Psalm 103:6-18 (MSG) - God makes everything come out right; he puts victims back on their feet. He showed Moses how he went about his work, opened up his plans to all Israel. God is sheer mercy and grace; not easily angered, he's rich in love. He doesn't endlessly nag and scold, nor hold grudges forever. He doesn't treat us as our sins deserve, nor pay us back in full for our wrongs. As high as heaven is over the earth, so strong is his love to those who fear him. And as far as sunrise is from sunset, he has separated us from our sins. As parents feel for their children, God feels for those who fear him. He knows us inside and out, keeps in mind that we're made of mud. Men and women don't live very long; like wildflowers they spring up and blossom, But a storm snuffs them out just as quickly, leaving nothing to show they were here. God's love, though, is ever and always, eternally present to all who fear him, Making everything right for them and their children as they follow his Covenant ways and remember to do whatever he said. I want my life to count, but not for me. I want my life to count for God and to make a difference in this world. I think this is what we all want and all our longings are only fulfilled in and through Jesus. But to do this, we need God to guide us, to help us, lead us - and set us free from things that hold us back like our sin. But God is so kind, he doesn't treat us as we deserve. Instead he's rich in love and kindness. The Bible tells us in this version above (The Message) that as far away as the sunrise is from the sunset, that's how far God has separated us from our sins. A bit like a sunset is only for a short while, God knows that our lives here on earth are over very quickly. It's hard to see that when you're young, but time will quickly pass. But God's love is eternal and if we seek God and do what he commands, choosing to fear and honour him above anything or anyone else, we will see his will in our lives. We will make a difference for the one true King that will last for an eternity. A Prayer: Lord, thank you that you put everything right. I'm sorry for things I have done, said and thought that have been wrong. I turn from these things and thank you that they can be burned away in your forgiveness and love. You are rich in love and goodness. You have forgiven my sin and I want my life to make an eternal difference for you, the King of glory. I choose to run to the Son today and every day. Amen.